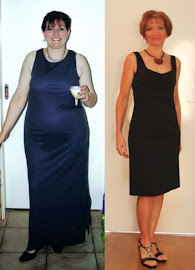 FitBody Fifty: Fitness: How do you stay motivated? Fitness: How do you stay motivated? Kathryn wrote a post the other day about her new approach to her fitness & health goals, and I LOVE its brilliant simplicity. When her inclination is to sit on the couch and eat some crap instead of going for a run, she asks herself: What's going to make me feel better in an hour's time? Being able to visualise the longer-term results of your exercise program or nutrition approach can be a great motivator. But a year, a month or whatever term you've set can also seem so far in the distance that it's easy to tell yourself that missing a workout or eating that chocolate bar isn't going to have an impact. You have plenty of time...you can start tomorrow, the next day, next week or next month. And then the time passes and suddenly you don't have enough time any more to lose that weight, train to run that 5k or ace your blood pressure test by whatever deadline you set. But thinking in the short term can work well as a motivator. If I'm tired and stressed and have a lot to do, the last thing I want to do when I get home in the evening is cook a meal. It would be much easier to just ring for pizza, or spread peanut butter on a couple of slices of bread and call it dinner. Applying Kathryn's method though, I know that I'd feel physically uncomfortable if I stuffed myself full of crappy carbs and fat, as well as disappointed in myself for making a poor choice. Last night, for instance, I was exhausted and felt a bit off-colour and the chicken breasts I had in the fridge weren't filling me with inspiration. I flicked through a few recipe books but came up with nothing that grabbed me. To make matters worse, our oven is broken, so anything requiring baking was out of the question, narrowing my choices. I was very tempted to pull out the pizza menu... But I knew that I'd feel much better afterwards if I made a bit of an effort and ate something decent. 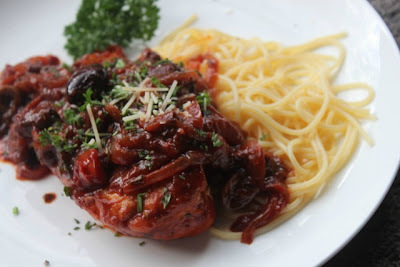 So Mr Google helped me out once more, and in 30 minutes we were eating this quick chicken and tomato casserole (with a few improvisations, using ingredients we had on hand). Then this morning I needed a little extra motivation to get myself out of bed at 5:30am. I'd had a disturbed night - don't really know why, but I seemed to be constantly waking the entire night - and 6:00am RPM wasn't an attractive proposition to my poor, sleep-deprived brain. Especially while I'm still on holidays. I had a short argument with myself in the 9-minute break between snooze alarms, and decided that an extra hour in bed wasn't likely to help me feel more rested. Bike Boy and Number One Son would both be up and about shortly and the chances of me getting back to sleep were pretty slim. On the other hand, if I spent an hour thrashing myself on the bike, I'd feel awesome afterwards. The lure of a mixture of exercise endorphins and a dose of smug satisfaction were too good to resist, so I got up and headed off to the gym. Of course I was right - I really did feel great after a good session sweating it out on the spin bike, and now I have the whole day to do whatever else I need to. Including a nap if I so choose. What works best for you? Long-term goal-setting or a shorter-term "What's in it for me NOW?" kind of outlook? Sadly I'm all about 'instant gratification' so it's hard for me to think about consequences. If it comes down to: do I want this chocolate; or do I want to get to a healthy weight (sometime down the track), the chocolate will always win. That's why I love this little gem - If you ask yourself "how will I feel in an hour if I eat a block of chocolate (as opposed to proper meal)?" it might be an easier choice. I must admit, sometimes I cook dinner rather than call for pizza because cooking seems easier than looking for the pizza menus! Sometimes it really is all about doing the next right thing :) Nice post Missy@+! I rarely buy take-aways mainly because they are so expensive and I'm a tight-arse. As for goals - it's mostly long term for me. If I have a hiccup, like an injury for instance, I am less likely to give up completely 'cause there's still that goal waiting to happen. Great post, off to check out Kathryn's. @Sandra - being able to see the short-term gain from doing just one thing is really helpful, especially when life threatens to overwhelm you. I think when you're having a stupidly busy period it's even more important to take this approach. It's too easy to just throw fitness and nutrition out the window because it all seems too hard. But when you break it down into small chunks, it really isn't. I often think about how I'll feel the NEXT morning. That moment when you wake up and either feel pleased with the progress of the previous day or full of regret. I find it quite motivating to imagine waking up on a high, rather than facing a day of 'getting back on track'. Amen. Hate morning-after "should haves"! The Biggest Loser - you lost me at "disgusting"
Help me out, would you? This post brought to you by the letter "O"